According to recorded documents, Alliance paid $161.58 million for the 13.91-acre property at 1515 Second St. -- a price which includes the buyout of a ground lease. The sale works out to $294,316 per unit. The overall price puts the sale among the larger of the year, including the $360 million The Irvine Co. paid for the 1,410-unit La Mirage Apartments in Grantville on Aug. 30. The Irvine Co.'s transaction worked out to $255,319-per-unit. Alliance's joint venture partner is an institutional pension fund. MetLife Real Estate Investors was the lender, providing loans up to $121.51 million. The prinicpal loan was for $106.59 million. The other loan referred to as "the future funding loan" was for up to $14.92 million, depending on how much Alliance needs for work associated with the property. The seller of the property was Coronado Commonwealth Apartments Inc., a unit of LaSalle Investment Management. The seller was represented by Darcy Miramontes, Kip Malo, Jubeen Vaghefi and David Young, of Jones Lang LaSalle (NYSE: JLL). Alliance represented itself. The 1971-vintage apartment complex, which only about three vacancies as of Sep. 30, according to MarketPointe Realty Advisors, was renovated in 2008. The complex offers studio to two-bedroom floor plans ranging from 404 to 1,063 square feet. The rents range from $1,193 to $2,683 per month. Amenities include an 18,000-square-foot clubhouse, meeting rooms, a business center, a catering kitchen, media room, beauty salon, tennis courts, dog park, pool, spa, tennis courts, a picnic area with grill stations and garage parking. Jeff Zuckerman, Alliance western regions chief financial officer, said Jones Lang LaSalle heavily marketed the complex, and Alliance liked what it saw. "This is probably the largest waterfront multifamily community in Southern California," Zuckerman said. 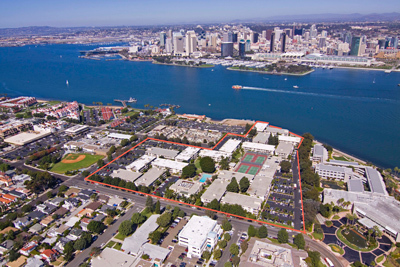 Miramontes said along with other assets, the waterfront complex is situated on the fourth largest parcel on Coronado Island -- only behind the Coronado Marriott Resort, Hotel del Coronado and North Island Naval Air Station. The 549-unit complex constitutes about 4.5 percent of Coronado's 12,000-unit overall housing inventory. Miramontes also claims that the property is one of only 24 complexes with 500 or more units in the county, and one of only six of that size located west of Interstate 5. It is also reportedly the only 100-plus unit multifamily property that overlooks the water in the county. The property had sold for $55 million or $100,182-per-unit in 1999, according to The CoStar Group (Nasdaq: CSGP). While Alliance Residential has been busy in San Diego County, it is probably better known here as a builder rather than a buyer. Alliance is building several properties under the Broadstone banner, including the 100-unit Broadstone Balboa in the 3200-block of Fourth Avenue in the Bankers Hill area. Amenities will include a swimming pool, spa, cabanas, valet, concierge services, storage, an exercise room, a community room with a kitchen and other features. The studio- to two-bedroom floor plans range from 600 to 1,650 square feet. That project is slated for completion by the end of next year. Alliance Residential is developing 360-unit Broadstone Kearny Mesa project next to Montgomery Field near the junction of Aero Drive and Sandrock Road, where five industrial buildings totaling 102,700 square feet are today. Alliance is now wrapping up construction on the 201-unit Broadstone Little Italy project at 1902 Kettner Blvd. “We were staffed strategically coming out of the recession and in a solid position to purchase [and develop] well-located multifamily development sites at discounted prices, as well as undertake several early-cycle development starts and value-add acquisitions,” added Drew Colquitt, Alliance’s managing director for acquisition, development and construction in Southern California. Including this recent high-profile acquisition, Alliance's Southern California region has acquired, started building, completed or contracted 13 projects with a total capitalization of roughly $1 billion during the current real estate since the recession ended. Over the past 13 years, Alliance has become one of the largest developers and private apartment owners, and the nation's 10th-largest management company, with a $9-plus billion portfolio and 67,000 units in 26 metropolitan markets.